This system can provide all data like temperature, gas , door status of your home on PC screen. All data of parameters like temperature etc are stored in database and can generate Excel file so that you can view data of any day in history you want. This system is very useful in modern houses. Here for demo i am taking 2 sensors: Gas Sensor and a Temperature sensor LM35. The heart of the system is PIC16F887 microcontroller. It monitors both our digital and anolog sensors. Then sends this data to the serial port via UART module. Hence we need to desing a GUI based software which can understand this incoming data and then dispay the appropriate values on screen. I am using Microsoft Visual BASIC 6.0 as my platform. I can easily interface COM port using the MSComm Port in components list. PIC16F887 has 10 bit ADC. It has 14 channels available. Result formats are shown below. 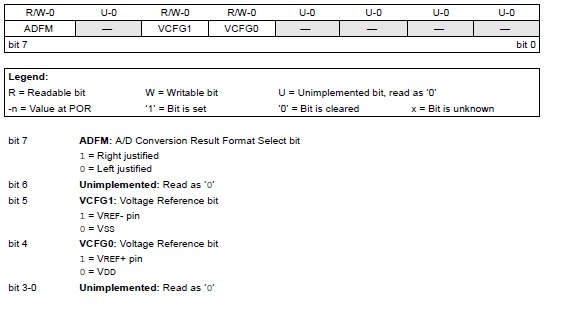 The 10-bit A/D conversion result can be supplied in two formats, left justified or right justified. The ADFM bit of the ADCON0 register controls the output format. 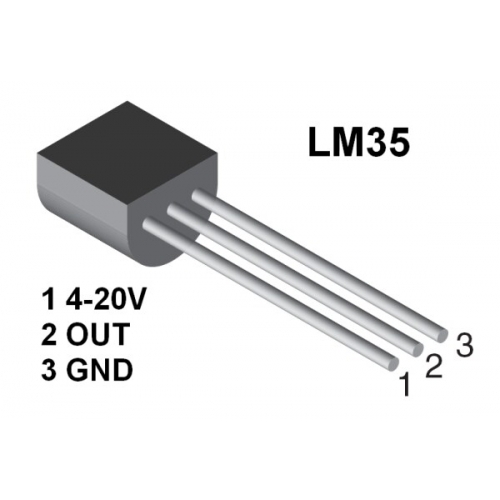 Now Gas sensor modules are available from so many vendors in the market at electronics shops or online. Here i am showing one of them. You can use any one. but once you need to check if it is working on +ve logic or -ve logic. I am showing one +ve logic sensor that is availabe here from parallax. Click here . Gas Sensor Module is designed to detect the presence of a dangerous LPG leak in your Home, car or in a service station, storage tank environment by interfacing with Microcontroller without ADC Channels and programming. In this version of LPG Gas sensor module two pots are included, one for trigger level setting and the other for setting sensitivity of the sensor. It allows to determine when a preset LPG gas level has been reached or exceeded. The module uses MQ-6 sensor to sense LPG leak. The MQ-6 can detect gas concentrations anywhere from 200 to 10000 ppm. For generating the database the timer2 is fired with some interval. You can see the whole video of simulation. Thanks , I’ve recently been searching for info about this topic for a long time and yours is the greatest I have found out till now. But, what in regards to the bottom line? Are you sure concerning the supply? I intended to post you this bit of word just to give thanks the moment again on your pleasing tricks you’ve featured on this site. It is simply tremendously open-handed of you to give without restraint precisely what a few people might have distributed for an e book to end up making some profit on their own, specifically considering that you could have tried it in case you desired. These creative ideas additionally acted as the fantastic way to be aware that many people have the identical interest the same as mine to understand lots more in terms of this issue. I believe there are numerous more enjoyable sessions up front for those who read your blog. Pretty great post. I just came across your weblog and wanted to say that I have truly enjoyed searching your blog posts. Whatever the case I am going to be subscribing for your feed and I am hoping you’re posting yet again soon! My spouse and I really wish to inform you you in which I am certain inexperienced to online blogging and undeniably enjoyed your work. More than likely I am likely to save your site post . You truly have impressive posting writing. Delight In it for sharing with our company your url page. I intended to post you one little word to finally say thank you as before regarding the fantastic secrets you have featured on this site. Interesting posting you authored. Certainly with bulk of it. I’m likely to begin following your blogging site. Hello would you mind letting me know which web host you’re using? I’ve loaded your blog in 3 different internet browsers and I must say this blog loads a lot faster then most. Can you suggest a good web hosting provider at a fair price? Cheers, I appreciate it! Fantastic goods from you, man. I’ve take into accout your stuff prior to and you’re simply too fantastic. I really like what you have got right here, certainly like what you’re stating and the way in which by which you say it. You make it enjoyable and you continue to take care of to stay it sensible. I can not wait to read far more from you. This is actually a great site. My spouse and I loved as much as you will obtain performed right here. The content is neat, your own written material is ideal. Thank you so much both of you. Sorry for late reply. I was away a long time for some reasons. Thanks for valuable support. I am not really great with English but I find this real easy to read . With havin so much content and articles do you ever run into any problems of plagorism or copyright violation? My blog has a lot of completely unique content I’ve either written myself or outsourced but it seems a lot of it is popping it up all over the web without my authorization. Do you know any ways to help prevent content from being stolen? I’d really appreciate it. Howdy would you mind sharing which blog platform you’re working with? I’m planning to start my own blog soon but I’m having a tough time choosing between BlogEngine/Wordpress/B2evolution and Drupal. The reason I ask is because your design and style seems different then most blogs and I’m looking for something completely unique. P.S Apologies for being off-topic but I had to ask! Thank you, I have recently been searching for info about this topic for a while and yours is the best I’ve discovered so far. But, what about the bottom line? Are you certain about the source? I simply want to tell you that I am just all new to weblog and actually loved your website. Most likely I’m want to bookmark your blog . You amazingly come with very good article content. Thank you for revealing your website page. I simply want to mention I am just beginner to weblog and actually loved this web blog. Likely I’m likely to bookmark your site . You absolutely have exceptional well written articles. Thanks a lot for sharing with us your webpage.